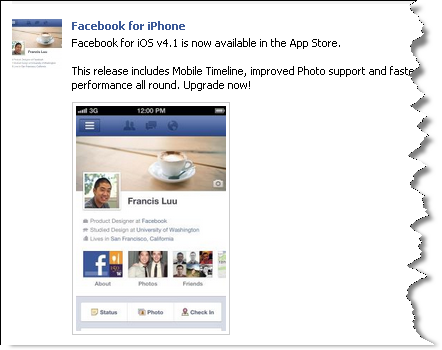 Finally, Facebook for Apple iOS devices (iPhone, iPad, and , iPod Touch) gets the latest update since October 2011. 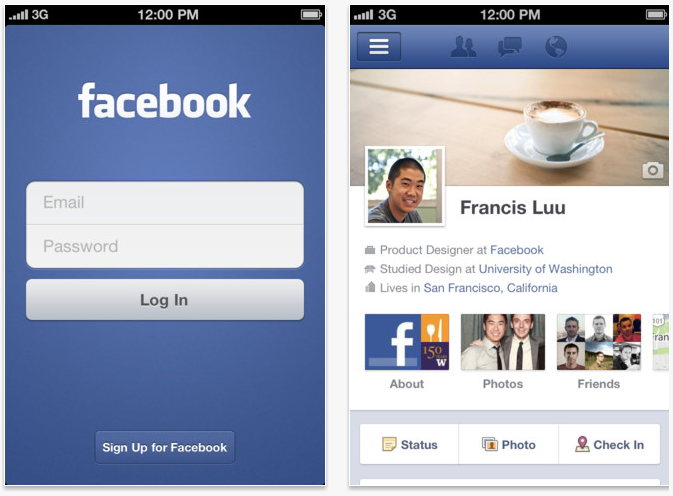 The last Facebook for iPhone or iOS devices was released last 25th of October 2011 as version 4.0 and just a couple of hours ago, they have now released the latest version (Facebook for iPhone v4.1) and was officially announced on their Facebook page. 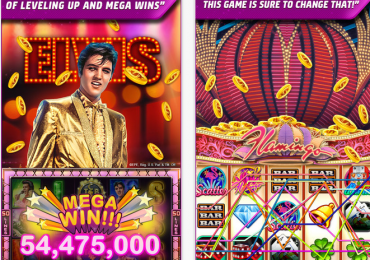 The main feature of this release after two months is the Mobile Timeline which was initially announced by Mark (CEO of Facebook) last September on their Facebook F8 Conference. I also posted an article on that same month on how you can enable your Facebook Timeline (as Developers Beta Release) to see the changes and for you to be able to adapt onto these changes as early as September. Lastly photos are easier to view, upload and comment on. If you’re not yet on or haven’t activated yet your Timeline, whether on iPhone or on your regular computer browser the process is for you to open your Safari browser, type the link below on your URL box and click the “Get Timeline” button to activate your Mobile Timeline. Once you have activated Facebook/Mobile Timeline, it won’t be published yet to give you time to explore it and update the necessary changes you want to add or remove before it goes live (usually seven days). Well, like the Facebook for Android there are still a couple of UI (user interface) that I feel needs to be updated or fixed by the developers. One example is the widgets or tiles below the user’s profile information, if you look into the box next to the “Friends” tile you’ll notice that it’s not really nice to see a that half-sliced box there. Why don’t they just put it on the next line for the end-user to view it and so that it will look nicer. By looking on the reviews from other users whom already updated their Facebook for iPhone, some were happy about it but of course some of them aren’t. Some of them were saying that there are still some issues like when someone from your friend posted a photo or picture and you click on it, you’ll end up viewing a different photo (known issue or bug). 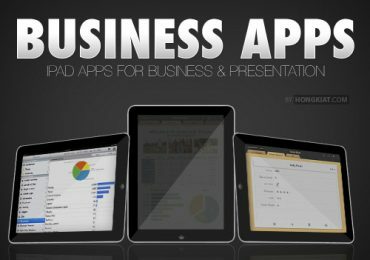 Some other users are saying that the application crashes. And the most common issue I found from them is that there’s no offline button for chat. These are just some of the complains I received, but of course it still depends on you especially if previous versions of Facebook is working for you.